It's pretty tough for individuals and even third-party shops to repair Apple products, and often hard to predict whether Apple itself will repair, decline to fix or replace a busted iPhone. However, Business Insider has unearthed a 22-page "Visual/Mechanical Inspection Guide," or VMI, that shows what qualifies as an "eligible repair." It's reportedly used to conduct a physical damage inspection and assess cost, "basically half the training for iPhone techs," an anonymous Genius told BI. Most of the guidance is common-sense, but some things stand out. If a tech spots a dead pixel, for instance, he's not obligated to fix it unless the customer asks -- an arguably shady practice. 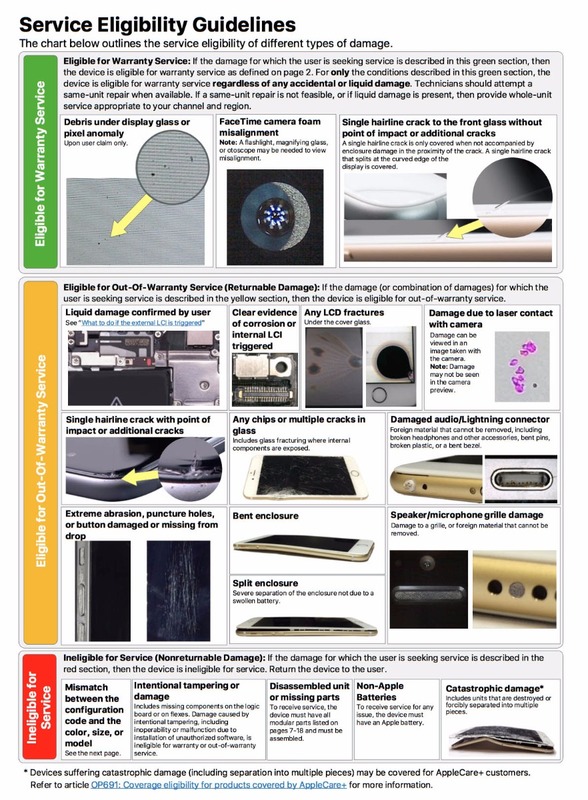 Apple also has a detailed procedure to check for water or liquid damage, something that's not very surprising if you own an model prior to the water-resistant iPhone 7 or 7 Plus. It's also interesting that Apple will repair, under warranty, a single hairline crack to the front glass, provided that it's not "accompanied by enclosure damage in the proximity of the crack," the VMI states. Apple will fix screen damage beyond that out of warranty for a $129 or $149 fee, depending on the model, and AppleCare covers it for a fixed $29 charge. On the other hand, Apple will shun if you have a bad accident or try to repair the device yourself. In those cases, it's looking for "intentional tampering or damage," "disassembled unit or missing parts," non-Apple batteries and "catastrophic damage." Apple has been recalcitrant in the past to even acknowledge product problems, but is arguably improving in that area. It might have changed its tune after the infamous iPhone 6 "touch disease," dented its quality-control reputation and resulted in lawsuits. In recent months, Apple quietly extended the warranty on first-gen Watch models, for instance, and has been replacing iPad 4s with newer iPad Air 2 models. As BI points out, the VMI is just a guide, and Apple techs will occasionally make exceptions. "There are always those one-off issues that the phone is technically not covered under warranty but we swap the phone anyway under warranty," one said.